Over the course of my career, I’ve attended several conferences, conventions, panels, symposiums, workshops, seminars and events with other fancy or weird names. Inevitably (even when some events by definition are meant to be interactive… e.g. the “work” in “workshop” is there for a reason), someone will end up giving a presentation, and if you are lucky, it will be interesting or related to your work. If not, tough luck, get your laptop or phone out to keep you awake… and yes, in case you are wondering, I am writing this during a presentation at a conference. Yeah, they only missed the part in which you make the next presenter start even later. Sadly, even if the presentation topic is not your cup of tea, sometimes the actual information turns out to be useful in unexpected ways. Not that it matters because by the time you wake up, you won’t remember. It makes you wonder how much information is lost in these events (which sometimes cost thousands of dollars to attend to, but most of us get paid to go so we easily forget this). Although I would love to tell you how to stay awake and alert during presentations, I am afraid I have not yet mastered that art; however, as a presenter there are a few things you can do to keep your audience captivated even when talking about snails’ sexual habits (because there are people who actually talk about it). Anyways, without further ado, here is the list of the often overlooked yet essential presentation skills you should keep in mind (specially when talking to a broad audience). 1. It’s not the audience’s responsibility to pay attention. In fact, quite the opposite, it’s our responsibility to keep their attention. We tend to think as presenters that if we got invited/accepted to be there and talk, everyone else must be interested in whatever we have to say, regardless of how we say it. The easiest way to overcome this is to imagine that everyone in the room paid a huge amount of money to see you, or that they came from very far away (both of which are often the case). 2. You are an entertainer. Make it interesting, or at least try (I applaud a little effort, even if unsuccessful). Think how other people look at your topic, how they relate to it, and who is your audience. You don’t have to be a circus though, otherwise they might miss the message or you might not be taken seriously. Some ideas to deal with this is to prepare a few clever jokes that you can use during your talk. If you are creative enough, remember that “dramas” and “thrillers” are also fun, so you can build up your presentation as a story and make it flow so that your audience can’t wait to discover the conclusion (and not because they just want to leave). Hint: People love to hear about other people screwing up. You can use some examples, but be sure that whomever you refer to is not in your audience (simply don’t say anything you wouldn’t want a friend of the screwed guy or gal to hear). If you do this just be tasteful and respectful about it. 3. Watch out for laptops or phones. This is obvious. Most people will start with low expectations and their attention will be directed towards something else. Do attention checks and make it your goal that by the end of the presentation no one is on the laptop or phone. Sometimes it is impossible, but at least make sure that the number of people on their devices does not increase. If it does, change tactics, try stuff, involve the audience somehow. 4. Make it memorable. Every presentation try to do or say something that a year later someone in the audience will say “oh yeah, this was the guy/gal who did this or said that…” Be careful not to overdo it either or it will work against you. Be remembered by the right reasons. Some friends have used this technique with things as simple as memorable hairstyles, and you’d be surprised by the effect and benefit of it. 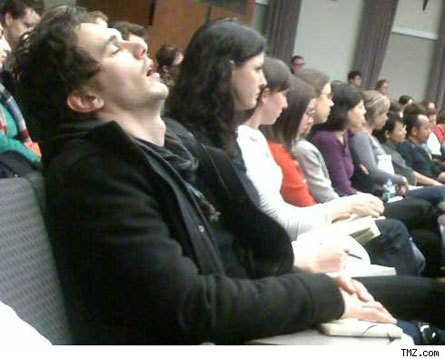 If you have never fallen asleep during a class or a presentation, I would question your humanity. 5. Answer questions briefly. Imagine you are in twitter. Answer in 140 characters or less (in case you didn’t notice, I’m not being literal, this just means go for the short, simple, concise answer). If the person who asked you the question insists on going on, tell them you will continue the talk off stage and don’t forget to invite the rest of the audience to the post-presentation discussion. This way it doesn’t look like you ran away from the question, but sometimes moderators will not speak up, and it can become annoying for the rest of the audience if you stick to a single question for too long. Also, we remember mostly the last part of the presentation, so you don’t want this to be the major takeaway. Finally, tailor your answers to the profile of the person asking. I am an engineer, if I get the same question asked from an artist and a medical doctor the answer will be very different. This is because you want to use whatever little knowledge you have of them and their fields to relate your presentation to their way of seeing the world. They will not see the world as you do, and it’s unlikely they’ll even make an effort to do so, but you can, you are the presenter after all, so do it. Questions are usually a good sign. It either means you didn’t bore them to death, or it means that you screwed up something really obvious. 6. Speak loud and clear…. Or don’t be afraid to ask for a microphone and certainly accept it once someone has offered it to you after hearing you speak. Trust me, if you have reached this stage, you need it. 7. Be honest. Few things are as annoying as when a presenter gets interrupted due to an obvious flaw in the presentation and they deny it, change subject, or do five attempts at answering the question or comment before even understanding the question. Your job as a presenter is not to be a badass know-it-all, but to share your knowledge, and improve it based on the (good and bad) feedback the audience is always giving you in real time. 7. Make it a conversation. Ask questions to the audience. Make the questions easy and obvious so that people feel comfortable answering. Some audiences are tough or shy, but keep it up and you will eventually get a response. Worst case, ask an extremely simple question and if no one says anything, specifically state that you are not going to move on until someone throws out an idea. Eventually they will and after that they will be more comfortable speaking up. Also, audiences are always more engaged if they feel empowered to interrupt you. They will feel as part of the conversation rather than a passive member, even if they don’t actually jump in the conversation, just them knowing they can if they wanted to helps. 8. Don’t shift the responsibility. If you are presenting shared work, or someone else’s work, don’t apologize, make excuses, or say that you are not familiar with some areas (what’s even more, never apologize for your own work either!). It’s your responsibility to know, you are presenting it for a reason. If you make an excuse, you will lose the audience’s respect. If you had a disagreement with another author or collaborator, say it and expose as unbiased as possible both sides of the story. Preferably, give good credit to the other opinion as well and let the audience decide (and if they decide against you take the hit gracefully and don’t argue or try to convince the audience or you will slowly lose believability). 9. Finally, practice. Imagine you have different types of audiences, figure out what would be the obvious questions ahead of time, prepare short answers, and time yourself. Even if you do this for yourself while driving around or before you sleep and just in the back of your mind,it makes a huge difference. Please note that all I wrote is in addition to the basic and obvious rules of “don’t memorize the whole thing”, “don’t write too much text on your slides”, and “don’t look at the screen or a reference sheet all the time when talking”, etc. Hope this helps, and (if you follow this guide) I hope to be amazed at a presentation by you in the future. Here are two great presenters whom I’ve had the chance to see. They executed very successfully the most unconventional presentations I’ve ever seen. 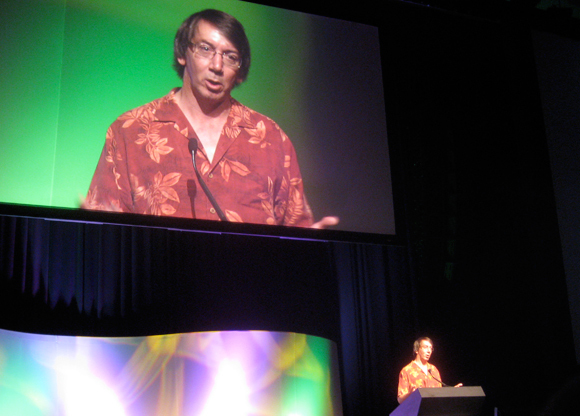 This is Will Wright, a game designer famous for creating Spores and The Sims. 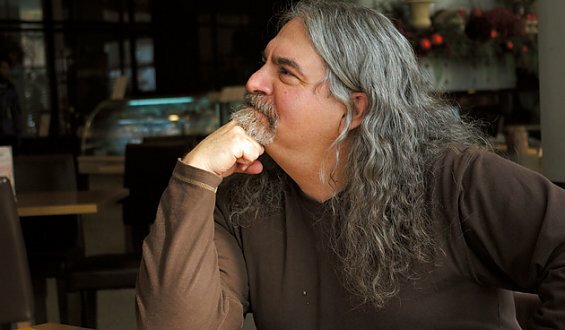 When he was at SIGGRAPH in 2009 he presented a little more than 200 slides in less than 45 minutes. Most of the slides included his cat. It was a fun, active and memorable presentation that did not lose the main point. This is Don Marinelli, co-founder of the Carnegie Mellon Entertainment Technology Center (ETC) and a Drama professor. During his 45 minutes, he acted out the presentation… literally, gestures, tone of voice, it was as if you were watching a play.